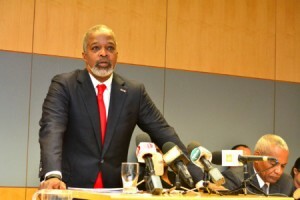 PHILIPSBURG, WILLEMSTAD - Embattled President of the Central Bank of Curaçao and St. Maarten Emsley Tromp intends to challenge attempts to remove him from his top post in Court. Tromp, according to Finance Minister Richard Gibson Sr., did not pass the screening process required by law for a person holding confidential position. Gibson Sr. made this public announcement in last week’s Council of Ministers Press Briefing. Consequently, Prime Minister William Marlin has not granted Tromp a “declaration of no objection” to continue in his post. Tromp has filed an objection in Court against Marlin’s decision. Tromp, in a press statement issued Sunday evening via his attorney Jairo Bloem, said he could not find himself in the decision of the Minister taken upon the advice of the National Security Service St. Maarten VDSM. “The screening process should, certainly with regard to persons who have exercised so-called trust functions for a long while within our society, be premised on verified or in any case verifiable facts. Facts can in any case never, as has happened in this case, give way to insinuations and/or baseless accusations,” Tromp said. “The Minister wrongfully and unjustly gave too much credence to the situation that a criminal investigation is ongoing against my person, which investigation is by the way enduring undesirably long. I emphatically contest and deny the suspicions of the Public Prosecutor’s Office and will defend myself against that in Court,” he said. According to the statement issued by the attorney, diligence is not served with media publications about a decision against which opposition and appeal can be filed, with an independent adjudicating/reviewing body, especially, because such publications cause further damage to the good name and reputation of Tromp. To that end, Tromp has chosen to limit himself to the brief statement issued on Sunday.